Every day, isolated Christians in Turkey face the questions of where they can go to gain spiritual input. SAT-7 TÜRK’s short devotional program Melody of my Heart seeks to be the source of daily support and encouragement needed by so many. Having received much positive feedback, the second season of Melody of my Heart will be broadcast later this year. The short, ten-minute episodes are written and presented by Duygu Özyörük. Presenter of Melody of My Heart, Duygu Özyörük, hopes the program will encourage Turkey’s Christian minority. 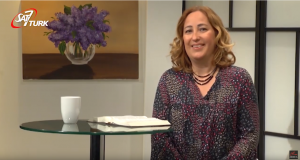 In each episode Duygu discusses a Psalm with the purpose of revealing God’s true nature and His loving heart. By explaining how the messages of the Psalms can be applied in everyday life, she hopes the program will strengthen the faith of believers in Turkey. Only 0.2 percent of the population in Turkey is reported to be Christian, and believers are often alone or only able to meet in small groups. With little access to Christian material, programs like Melody of my Heart can be invaluable resources for these isolated viewers. ‘Psalms are the melody of the heart; sometimes sad and complaining, sometimes joyful and glorifying God, sometimes dark and morbid, sometimes happy and hopeful’.